Two years ago my mom sent me this photo and asked me what I thought was going on. We discussed sunburn…but it didn’t really fit. Last year she sent me another similar photo. It seemed that something was seriously irritating Scrappers nose but generally just in the spring. Both times my mom put some ointment on it and it went away but remained a mystery…until this spring. While surfing the web my mom came across the fact sheet below and we think she has solved the mystery. 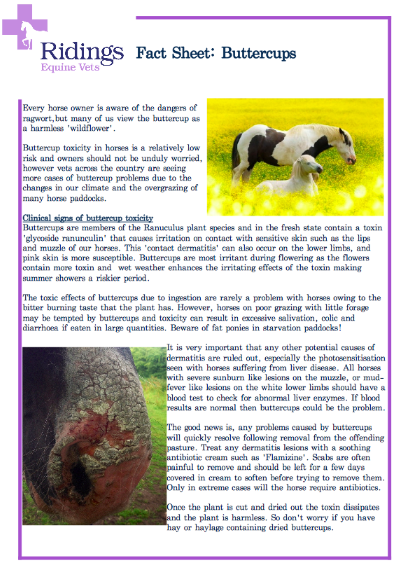 It turns out that buttercups can cause contact irritation, especially when the weather is wet, and it is more likely to irritate white skin. Keep in mind that Scrapper is not eating the plants, he has plenty of access to hay and grass, he is simply touching the plants while he grazes. 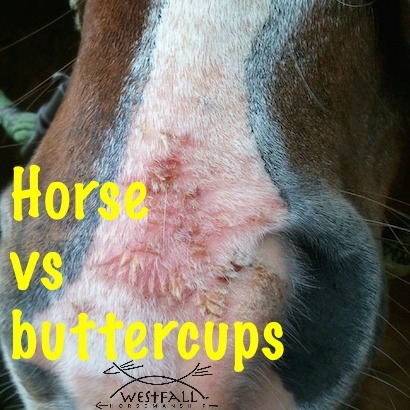 I had known that buttercups were toxic if eaten and that horses generally avoided them because of their bitter taste but I didn’t know they were irritating to touch. Did you? Click on the photo to visit this website and read the entire article. ← American Pharoah and reining horses? Interesting. Our pasture fills with buttercups in the spring and our goats won’t eat them either. They may be having a similiar irritating effect on their noses. I’d never heard of it either and I have a pasture full of Buttercup. Hate it. I’ve seen cracked noses before, just not often. Interesting. I know pink/white noses can chafe or sun burn easily. Another yellow flower that looks very similar to dandelion commonly known as catsear (part of the same family) can cause stringhalt if eaten, especially dried in hay. They look very similar. So often see horses in paddocks of yellow flowers and cringe. Most don’t eat them which is why I think it’s not known or accepted that they won’t.